Music Video NBC Revival Misc. A Fitting Spoof: DS was parodied in Spoof, a 1969 Marvel comic book. A Titanic Love Story: The Dark Shadows Story Digest Magazine was an interesting cross between a comic and a paperback book. Interview with the Vampire: Jonathan Frid comments on the DS collectibles featuring his image. In Black and White: Read about the life and career of Nancy Barrett (Carolyn Stoddard) in excerpts from various fan magazines. Sweet Sixteen: Many issues of 16 magazine, were filled with Dark Shadows articles and photos, and the July 1969 issue is a prime example -- images from the early childhoods of David Henesy, Denise Nickerson, and Jonathan Frid -- plus a dreamy pic of Don Briscoe, and backstage gossip. Collecting Big Lou: While he appeared on two popular soap operas -- All My Children and Dark Shadows -- pictures of Louis Edmonds was featured on a variety of collectibles, including gum cards and book covers. A Conversation with Dan Ross: Using the pen name Marilyn Ross, Dan wrote a series of popular paperback books based on Dark Shadows while the show was on the air. Collectibles Closeup: Books: A look at many of the books based on, or about, Dark Shadows, including a few volumes written by DS stars David Selby, Lara Parker, Kathryn Leigh Scott and Diana Millay. Since I wrote The Dark Shadows Collectibles Book (Pomegranate Press, 1998), I'm frequently asked what specific collectibles are worth -- and where the items can be bought and sold. One answer pretty much covers it all: "Go to eBay." If you're a web surfer, you've probably already visited eBay at some point. It's the world's largest online auction site, and there are literally hundreds of DS items for sale there at any given moment. Click here to see for yourself. If you're trying to figure out what an item is worth, do a search and see what people are paying for a similar one. But be careful: just because someone is charging a certain amount doesn't mean people are willing to pay it. If a price is set and no one has bid, the item may be overpriced. Check "completed auctions" to see how much collectibles are actually selling for. There's never been a better time to be a DS collector. Not only are nearly all of the vintage collectibles easier to find than ever, there are lots of fun new items on the market as well. MPI Home Video is in the process of releasing a set of bobblehead figures (pictured here), and they've already re-created Josette's music box. Click here to visit the MPI DS Merchandise page. Millions of kids ran home every day to watch Dark Shadows -- the classic soap opera that aired on ABC-TV from 1966 to 1971. And to the delight of many manufacturers, those kids had allowances burning holes in their pockets. As a result, there was a flood of merchandise on the market, including games, puzzles, comics, Viewmaster reels, scale models...you name it.... Today, the items are collectibles. Click below to read about them. In February '06, fans a set of Barnabas and Quentin dolls hit the market. Click below to find out more; and click here to read about it and the fantastic new DS DVDs. Barnabas & Quentin action figures, from Majestic Studios, Inc. 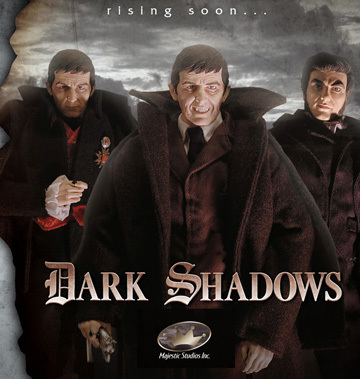 In conjunction with the release of Dark Shadows on DVD, a cool set of bobble head figures has been produced -- including Barnabas, Angelique, and the Werewolf. There's never been a better time to be a DS collector. There are tons of new items on the market, including bobbleheads, action figures, and boxer shorts. Click here to read about the new DS DVDs.